-25% on the total bill! Authentic and friendly place! Low key but great atmosphere and food. Everything was Indian except the food. There was too much water in the lassi, hence it wasn't creamy at all - just very liquid. The aloo paratha was nice, but the plain naan didn't meet my expectations (they probably don't have a proper tandoori oven). Both the chicken tikka and the murg malai tikka were hard and they hardly had any taste. The dal makhni was more like a rajma. The only good thing was the rogan josh (gravy was very good but lamb was chewy). I lived in India for many years, so I know how Indian food tastes! The atmosphere is nice, the food is good, but the staff is unfriendly and rude. I go here every now and then and each time I try to take a new friend with me. Everyone has always been happy with the quality of the food and service. And as for myself, what else can I say? :D I'm probably the most satisfied amongst all my friends... Thanks for everything :) I'll be back soon. The food was great, so were the portions. The service was a little bland, it could definitely improve. Restaurant a little bit hidden, but good quality food and nice service. 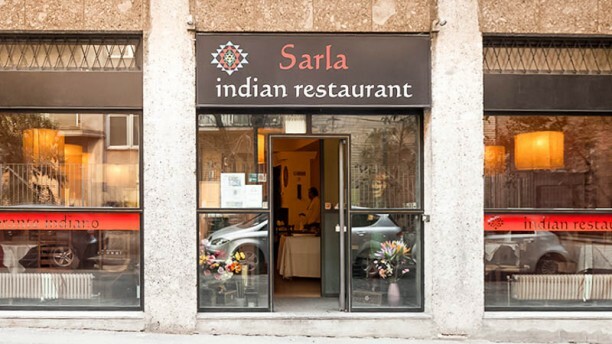 I have been to many Indian restaurants and Sarla was much better than my expectation. I strongly recommend Sarla!! Cost restaurant, not much guests but I liked the setting and the open- window kitchen. I went there for family dinner, after papadum, my son enjoyed chicken tikka, my wife chicken byriani and I tried chicken Danshak. We all liked it and decided to add paneer with garlic naan. It’s definitely worth a try: savory, not much quantity in each dish, service is quick. Recommend if you feel like indian. They will provide.